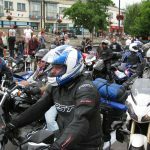 The Largest Free Motorcycle Meet In Europe – See you there? 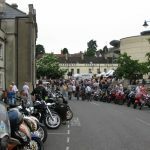 That’ll be the Calne Bike Meet in Wiltshire and its on Saturday the 28th of July. The event completely surprised us. Thousands of motorcycles of all sorts. One of the two keys to the mood was that it didn’t matter what you were riding, it mattered that you rode. Love that! The other key was that the townspeople completely open up themselves and their town to us all. For once, motorcyclists are absolutely welcomed. I hope you’ll take the chance and head on over. It’s fun, and its for charity. There’s more info on the event link. If you’ve not read my book ‘Into Africa’, or you have and you’d like to get a copy for a friend, this is the chance to nab one for silly money. Sadly, we had 1,000 copies arrive from the printers with mild damage to the covers. I’m not going to bin them or even pulp them – that seems wrong. I said ‘mild damage’. Yes, but I won’t put them for sale at even close to the full price. 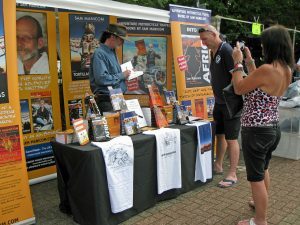 My 4 books are £13.99, but these copies of Into Africa will be going for just £5 at the Calne Bike Meet. A good deal? Come and see for yourself. Another bonus of heading over is that when you take the time out to get off the dual carriageways you’ll find that Wiltshire is pure motorcycle magic. Lanes through tiny villages, through shady woods and past golden fields, and tracks of all levels. Both will have you smiling and the tracks will have your tyres pinging stones! Make a full weekend of it? We will be!